In this article, I will introduce you to 5 free online Twitter cover photo maker websites. 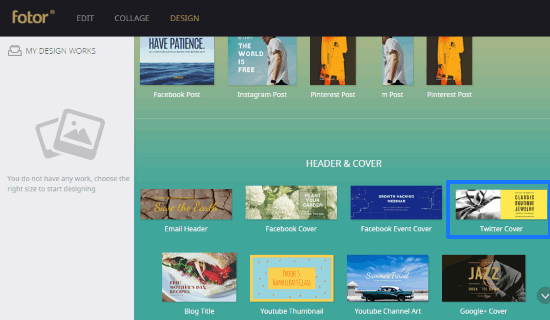 Most of these websites provide tons of free templates to choose from and then personalize them to create a beautiful cover pic for your Twitter handle. Yes, of course, you will be able to download the designed cover pic as JPG, PNG, etc. format which you can then upload to Twitter to set as the cover photo. In addition to that, you can also write text, upload more images to add, insert clipart, stickers, and apply photo effects to design a more visually appealing covers than other Twitter users. 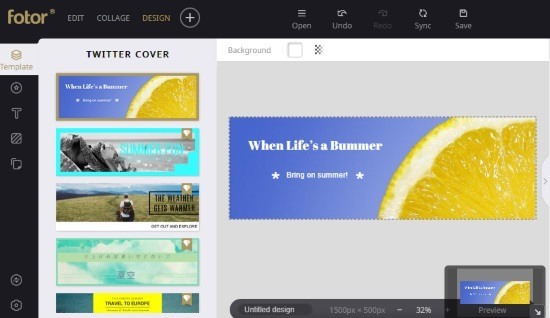 Best of all, these Twitter cover photo makers can also be used to design social media posts for other platforms like Facebook, Instagram, Tumblr, LinkedIn, etc. Canva is a free online Twitter cover photo maker which provides tons of templates to design a visually appealing Twitter cover pic. You can personalize templates, upload photos to add in templates, write fancy text, etc. and then download it as JPG or PNG format to set it as your new Twitter cover photo. Not just Twitter, you can use it to create social media posts for other platforms as well like Facebook, Instagram, etc. Best of all, it can help you design a beautiful Twitter header within few minutes. What I liked the most about Twitter header maker of Canva is that it intelligently displays how your Twitter cover photo will be displayed on your profile. This will help you design cover photo corresponding to your Twitter profile picture. Visit the link provided above which will directly take you to Free Twitter Header Maker of Canva. Click on the “Start Designing a Twitter Header” button to access its editing interface, as shown in the screenshot above. The editing interface is very intuitive. On the left you will see a panel with options to choose layout i.e. Twitter cover photo template, insert elements, images, shapes, text, etc. on the template. After selecting a template, you can personalize it by using the editing options that I just mentioned. In case you don’t want to use templates, you can then upload any high-resolution image and adjust it on the editing canvas. After that, you can edit it by adding some text or other images. But, if you are not a very good designer like me then I will suggest you to use the templates. In the end, when you have personalized the template, you can download it and update your Twitter handle cover with it. Fotor is another free online Twitter cover photo maker on my list. It also lets you create designs for other social platforms like Facebook, Instagram, Pinterest, Google Plus, etc. You can work with it in the same way as you did in Canva i.e. select a template and then personalize it. Apart from that, you can add images, stickers, text, and shapes to your Twitter cover photo. Do note that not all templates are free to use, try to stay away from the templates marked with a diamond. Start by creating a free account on Fotor. After that, select the “DESIGN” option which will open its online editing interface, as shown in the screenshot above. It will automatically pop-up a screen and will prompt you to select a design type. Select “Twitter Cover”, as shown in the screenshot below. After that, it will automatically resize its editing canvas as per the Twitter photo cover dimensions. 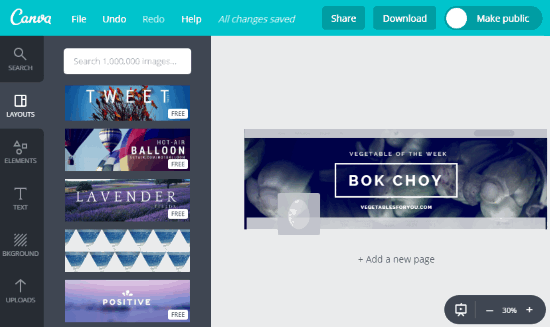 Its editing interface looks quite similar to Canva. On the left, there is a panel with all the editing options like select templates, upload photos to add in Twitter cover, add text, stickers, etc. The templates are totally customizable, you can change the written text on them; just click on them to start editing. You can also change the template photo if you want. 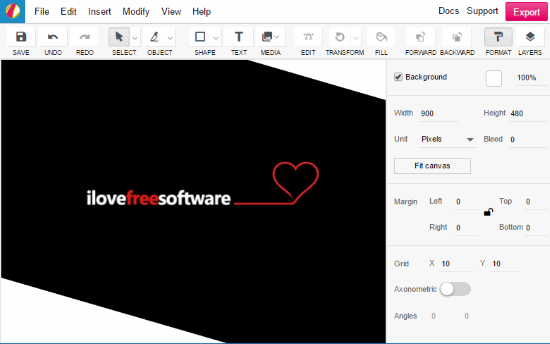 Fotor provides an extra option as compared to Canva i.e. apply effects to photos. Select a photo and then click on the Effects option that appears on its editing interface. You can then select an effect and adjust its Exposure. Once your Twitter cover is designed, you can download it as a JPG, PNG, or PDF format from the “Save” option at the top. FotoJet is another free online Twitter cover photo maker which works in the same way as other two Twitter cover makers on my list. It also provides tons of templates to choose from, which can be customized and then downloaded as an image. Not all templates are free to use but most of them are. You can use it for three purposes: designing a social media post for YouTube channel art, Facebook, Google+, Tumblr, etc., edit a photo, and make a collage. Visit the link provided above and create a free FotoJet account. After login, click on the “Create a design” button at the homepage and then select “Twitter header” from the Social Media Header section, as you can see below. 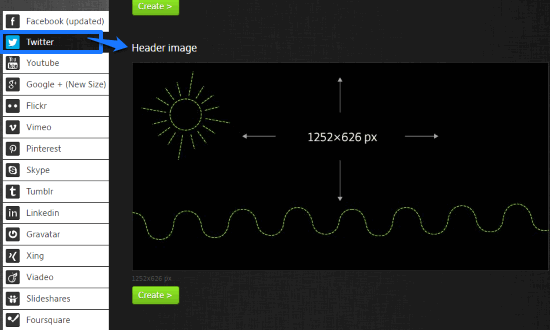 After that, you will see its online diagram editor interface and you can start designing your Twitter cover photo. This online Twitter Photo Maker also shares the same sort of interface like Canva and Fotor i.e. a left panel with options to select a template for cover pic, add fancy text, add clipart, and choose a background. After selecting a template, you can customize it by changing the written text and photo on it. In case you want to design on your own, then start with uploading an image and then stretch it to the full area of editing canvas. Next, you can add some text and clipart to make it more appealing. In the end, save it on your PC as a JPG or PNG image. Gravit is another free online Twitter cover photo maker. With it, you can design social media posts like Facebook, YouTube, LinkedIn, Twitch, Google+ cover, etc. Unlike other Twitter cover makers on my list, it doesn’t provide any customized template. So, if you think you can create an amazing Twitter cover photo without any template, then you can check it out. You need to create a free account on it in order to use it. After creating an account, you can create a new design from the Dashboard. 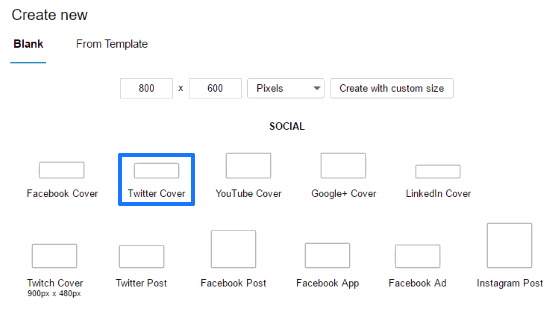 Make sure you select “Twitter Cover” when it prompts you to select the design type, as shown below. As soon as you select the design type i.e. Twitter Cover, you will see its editing interface as shown in the main screenshot. All the editing options are available in the toolbar at the top like bring an element to the top/back of another element, insert text, photo, shape, etc. What makes it stand apart from other similar websites on my list is that it supports working with layers like any standard image editor. The option to use layers is at the top-right part of the editing interface; click on it to see the Layers toolbox from which you can add, make visible/invisible other layers, etc. I hope this extra layer-support will help the pro users to design more stunning Twitter cover pics. Once your cover pic is designed, you can export it as JPG, PNG, SVG, and PDF. Social Media Image Maker is the last online Twitter cover photo maker on my list. It also doesn’t provide any customizable template to design a cover for Twitter handles online. All you can do is upload a single photo and use its photo editing options to create a Twitter cover. In addition to Twitter, you can also design social posts for other platforms like Facebook, Vimeo, Google+, LinkedIn, etc. The designed Twitter cover can then be exported as image. Visit the link provided above and then choose to design “Header image” from the Twitter section, as shown below. After that, it will prompt you to upload an image of “1253 x 626” resolution. Do note that it will not accept any image with lower resolution, than the specified one. It then opens the uploaded photo in its editing interface. All editing options are at the top. 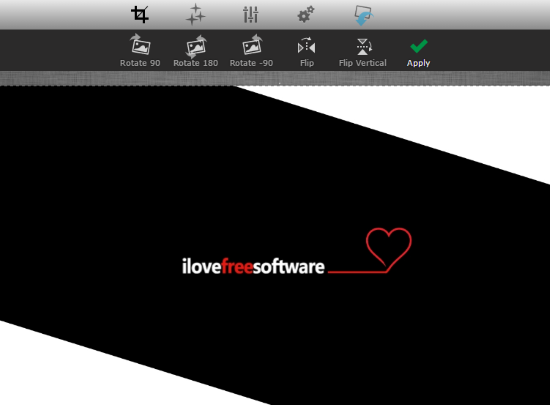 However, it just supports some basic image editing options like flip, rotation, crop, resize, etc. Use these options if you want to or you can simply skip the step by clicking on “Apply” button. In the next step, you can apply effects to the photo from the “Effects” option at the top. The effects include some basic color effects and the option to adjust image brightness, sharpen, etc. In the end, you can download the Twitter cover as JPG format; click on the “Export” button at the top. In this article, I introduced you to 5 free online Twitter cover photo makers. I really liked the fact that most of them provide customizable templates and other standard photo editing options which can help you design more beautiful and funny cover pics for your Twitter handle. Do check all of them out to see who proves to be the best for you. In my case, I really liked Canva and Fotor, honestly, I find both of them quite same but I prefer Canva more as it intelligently showed how my cover will look exactly on Twitter.